The NSSL is looking towards expansion in 2014, the league's 5th season. The National Scholastic Skateboarding League is a non-profit charitable organization that supports middle and high school teams in Orange County and San Diego and has become an outlet for students who might not be as involved in school to participate in a non-traditional sports program. It brings structure and a sense of responsibility to team members: all skaters must maintain a C-average or better to join in the fun. The league’s Friday night events, which feature skaters on 45-second runs in the street course, bowl and on the mini-ramp, is a way for these boys and girls to showcase their individual talent in a structured team environment. And it allows them to be recognized for a sport they are truly passionate about, which is evident in the amount of enthusiasm and general stoke seen at any given league event. 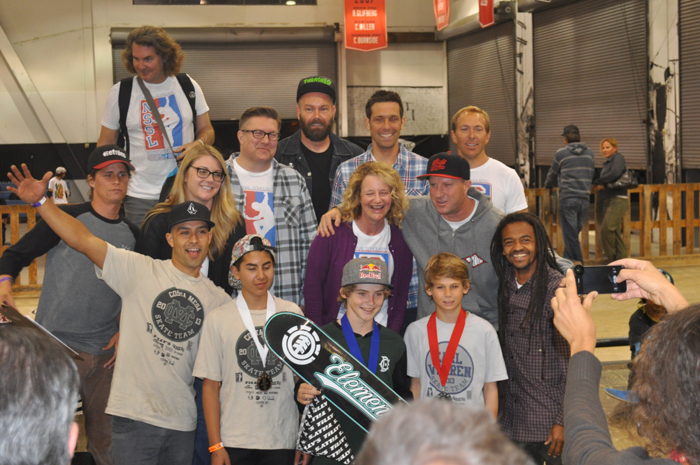 One way individual skaters and teams are recognized is at the season-ending awards night and fundraising event, to be held at the new private Volcom Indoor skate park at headquarters in Costa Mesa on Saturday, June 15. At the annual dinner, a silent auction & raffle will be held to support the league's next season. Also, the winner of the coveted Woodward Scholarship will be announced as well as the winners of the inaugural $1,000 Skater Scholarship (underwritten by Volcom and Suburban Plumbing); one of which will be awarded to a high school junior or senior team member and the other to a current college or career technical school student. The NSSL currently has over 300 scholar athletes members, both boys and girls, participating in the league. All students produly wear their school's t-shirts, apparel donated by league sponsors like Tilly's, Volcom, Etnies and Vans. 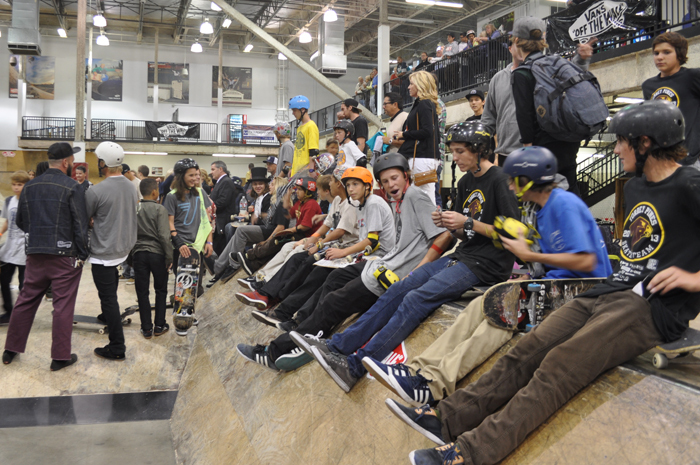 In April, the season’s best met at the Finals held at the Vans Indoor skate park in Orange, Calif. 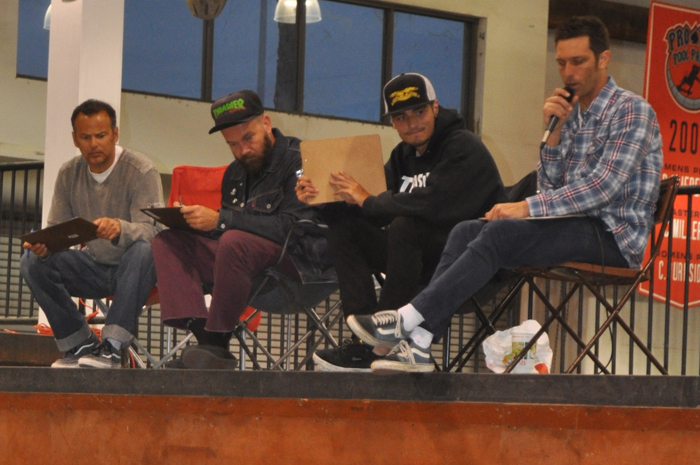 There, top skaters from San Diego went head to head against the OC’s finest. “The level of skating from when we started to now has just gone through the roof. Now, every contest is just a battle. We've gotten our name out there and we are finally garnering some respect amongst the kids, which has been great,” said NSSL Head Coach Tristan Stegmaier in a phone conversation. Tristan is a special education teacher at Northwood High School and grew up skating. He has been involved in the league since the start four years back and is currently the Head Coach of three teams in Orange County. Tristan Stegmaier, seen here on the far right with the mic, and other volunteer judges at the Finals earlier this yea. 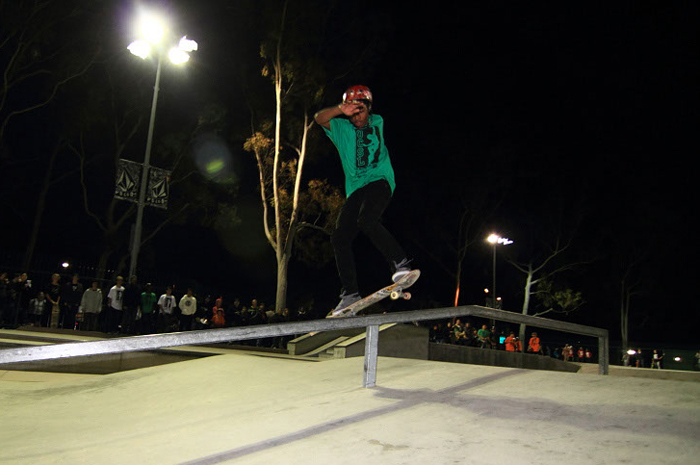 The NSSL was originally launched as the Orange County Skateboarding League in 2010 and included 4 area teams. Now, the nation's first (and only) school-sanctioned skateboarding league boasts 26 teams and is looking to continue to grow. According to a recent NPR feature on the NSSL, "An industry survey last year found there are more than 12 million skateboards in the US...as the number of public skate parks grows." Add to this the rise in popularity of events like X Games and Street League Skateboarding, and it seems only natural that the league is looking to expand to include teams in Los Angeles and northern California…and beyond. Imagine skate teams in schools across the country! "One thing that is really cool about the league, and this could be a heartbreaker, but not everybody is going to be able to pursue a skate career - whether or not they put in the work to be filming everyday and think they are going to get sponsored or if they are already on a team. Sometimes you have sponsors and it just goes nowhere and maybe you're left thinking 'what do I do now?’” explained Dominick during a phone conversation. “I think this is really why the league is so cool, because you aren’t so heartbroken if you don't go the pro skater route. And you never know, you might be really good at something else that you never thought of and be way more psyched on that than skating, but you will still continue to skateboard. And that's the main thing, you don't want to think you have to throw away your board when you get a job - you've gotta be a skateboarder for life." Dominick Walker was a student at Costa Mesa High School when Katrina approached him to get involved in the league as a junior. He went on to become a 2x Orange County Skateboarding League champion before graduating in 2011, when he immediately began working as an intern at NSSL and served as the coach for his team. Now, at 20-years old, he has since moved on to pursue a career as a professional skater and currently rides for Active Ride Shop in Costa Mesa and is on the flow team for Spitfire, Thunder and Element. He credits his participation in the league for providing the structure in his life to get him to where he is today. "I had never had a job in my life - I just grew up skateboarding and going to school. To have the experience of waking up in the morning, getting into a routine and going to work in general was cool because I knew that I was going to be doing something I liked. It was all about skateboarding, so I was hyped on that. I was put in a position to be a leader, being the skate coach as well," said Dominick. "On top of that, it was a real good experience for me to explore different fields. Not only was I put into a position of being a leader as a coach, but being involved with the league as an intern gave me the opportunity to see skateboarding through a different light. I wish all the kids could have an internship after they graduate because it really makes you believe you can still work in the skateboard industry. And for some kids, maybe still be able to pursue a skate career." "Katrina was always around the school and when she started forming the teams she asked me if I was interested...For the remainder of my time at school I was skating in the league." Replacing Dominic as league intern around this time last year was another former NSSL member and recent high school graduate. Sean Istaste, who just turned 19 in March, grew up in Florida but now lives right next to Etnies in Lake Forest. He started skateboarding around age 13, when he moved to California, and he graduated from Northwood High School last year. He spends his days at college, working for the league and, of course, skating. He also credits his involvement in the league with giving him direction and a sense of purpose. “I started skating when I was 13, and sadly when I was 15 I fell into the cool kid habits of high school and didn't really skate for about a year. I got back into skating when I was 16 because Tristan told me about the league. I rallied a bunch of my friends and we got a team together and it's been all skating since then,” explained current NSSL inter Sean Istaste. The NSSL’s 5th season will start in March 2014, but in the meantime there are summer skate camps, skate park tours, career day field trips and other league fundraisers that will take place throughout the summer and into the coming school year. For more on the league, head to nsskateboardingleague.org, or check them out on Facebook, Twitter and Instagram.